Are you flying somewhere today? Feeling somewhat nervous about it? You have absolutely no reason to be worried; probability is on your side. Grab some peanuts, put your headphones in, sit back and relax. The airplane has revolutionized our existence. It has cut journeys that used to take weeks and months into just a few hours. It's also extremely safe, but people continue to fear it. A recent plane crash in the French Alps may have increased people's anxieties. Germanwings Flight 9525 crashed on Tuesday not long before 11 am. Tragically, everyone on board, 144 passengers and six crew members, died in the process. Germanwings is now a trending topics on social media and will undoubtedly continue to be discussed in the coming weeks. Along with "Pretty Little Liars" and Angelina Jolie, it's currently one of the top subjects people are searching for, Google Trends reveals. We are both terrified of and fascinated by death, particularly when it happens in unusual ways. The likelihood of dying in a plane crash (or even being in one) is so slim it's almost pointless to quantify. 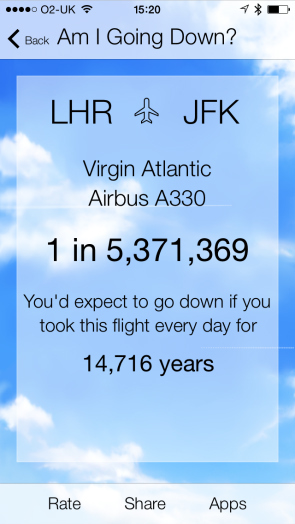 According to The Economist, the probability of your plane going down is around one in 5.4 million. Other reports place the odds closer to one in 11 million. To put this into perspective, you are far more likely to be struck by lightning or attacked by a shark than you are to die in a plane crash. And there are even more common things that kill decidedly more frequently, including the flu. Traveling by car is 100 times more deadly than hopping on a plane. 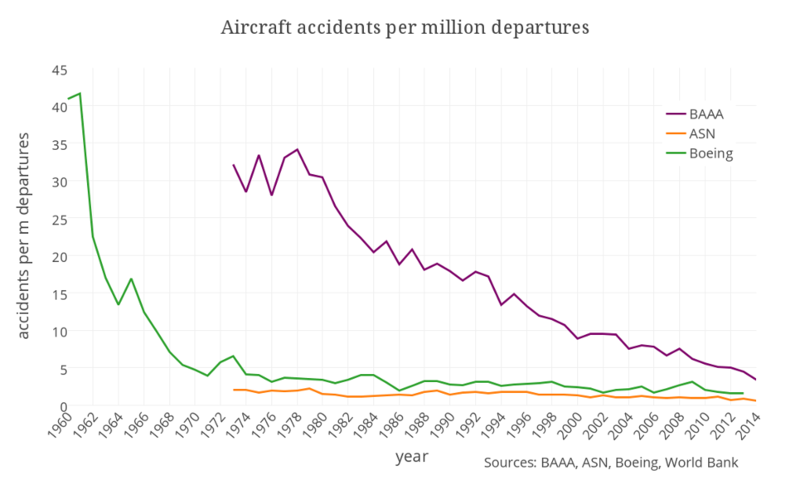 Not to mention, statistically, it's never been safer to fly. Perhaps this helps explain why we become so captivated by plane crashes when they do occur; they're just so incredibly rare. At the same time, media coverage of these sorts of events is undeniably excessive and hyperbolic. This trend is driven by a desire for increased viewership and profits. Does this say more about the media or more about us? It's a two-way street: Major news networks consistently report on tragedies because they know the public will pay attention. In 2014, plane crashes often dominated the news. From the mysterious disappearance of MH370 to the tragic crash of Air Asia Flight 8501 in December, there were eight fatal plane crashes over the course of the year. In total, commercial airline accidents killed 992 people across the globe in 2014, the most since 2005, Vice reports. But if you look at data surrounding airplane crashes in a broader sense, they have decreased exponentially over time, as highlighted by the Guardian. And at this point last year, there had already been 33 plane crashes. As of the Germanwings crash, the number for 2015 stands at 17. It's also very telling that in 2014, airplane crashes received 43 percent more media attention than the 1.24 million ground traffic fatalities that occur across the world every year, as noted by the Washington Post. Interestingly, research has shown that the habitual coverage of plane crashes hasn't necessarily served to increase fears of flying, but it certainly hasn't helped deter them, either. Aviophobia, or the fear of flying, affects around 6.5 percent of the population, ABC news reports. A survey from Chapman University suggests that 43 percent of people have at least some fear of flying, and around 9 percent are so afraid they won't even step foot on a plane. With that said, none of this information will serve to comfort the loved ones of those who died on the Germanwings flight. Perhaps they would find some relief, however, if they weren't inundated with images of the place those closest to them perished. Should there be a discussion surrounding why this plane crashed? Absolutely. But that doesn't require 24/7 coverage of the crash site. At any given moment over the course of the next 24 hours, people will die from poverty, famine, disease, war and other forms of abhorrent violence. Simultaneously, we face the ongoing effects of climate change and inequality. Perhaps we should refocus our obsession onto these kinds of issues. It would be nice to live in a world where issues are granted attention based on their everyday impact and imminence, rather than their potential to generate profits in correlation with the whims of a fickle public. Maybe that's just wishful thinking, but it's certainly still something to think about.